The public is deeply divided along partisan and ideological lines in its opinions about environmental issues. And these differences are reflected in how the political typology groups view these issues. In views of global warming, nearly all Solid Liberals say there is clear evidence that Earth’s temperatures have been rising, with 95% saying this is mostly caused by human activity, such as burning fossil fuels. 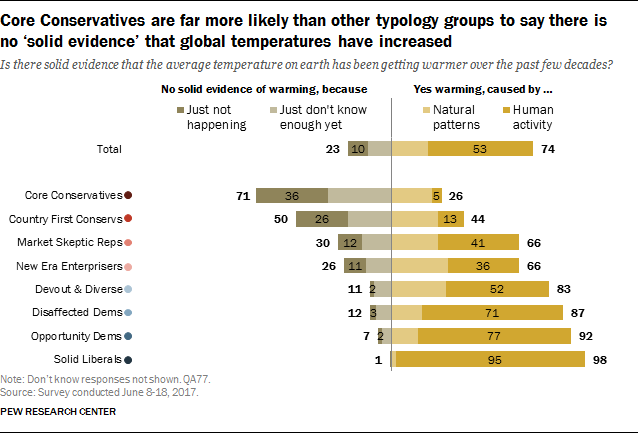 Among Core Conservatives, only about quarter see solid evidence of global warming – and just 5% say the main cause is human activity. Opinions vary across the other typology groups. Majorities across the Democratic-leaning groups say there is solid evidence of global warming, but only about half of Devout and Diverse (52%) say it is mostly caused by human activity, the lowest share in any Democratic group. Among Republican-leaning groups, Core Conservatives are the only one in which a clear majority (71%) say there is no solid evidence of global warming. Country First Conservatives are more divided (44% see solid evidence of warming, 50% say there is no solid evidence). Two-thirds of Market Skeptic Republicans and New Era Enterprisers (66% each) say there is solid evidence of global warming. Similarly, there are substantial differences in both partisan coalitions in views of stricter environmental laws. 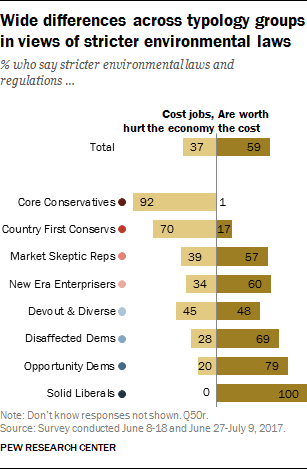 Large majorities of Core Conservatives (92%) and Country First Conservatives (70%) say stricter environmental laws cost too many jobs and hurt the economy. But majorities in the other GOP-leaning groups – Market Skeptic Republicans (57%) and New Era Enterprisers (60%) – say stricter environmental laws are worth the costs. Among Democratic-oriented groups, sizable majorities say stricter environmental laws are worth the cost, with the notable exception of Devout and Diverse. This financially hard-pressed group is divided: 48% say stricter environmental laws are worth the cost, while 45% say they cost too many jobs and hurt the economy. Views on the importance of personal efforts to help protect the environment given the cost vary across typology groups as well. Among the public overall, 53% say protecting the environment is so important “that I do things in my own life to help the environment, even if it costs time or money,” while fewer (37%) say “it’s important, but I don’t have the time or money” that it takes right now. Just 9% say it is not that important right now. Solid Liberals are the most likely to say helping the environment is so important that they do things in their own lives despite the cost or time investment: 80% say this, while just 17% say it’s important but they don’t have the time or money right now. 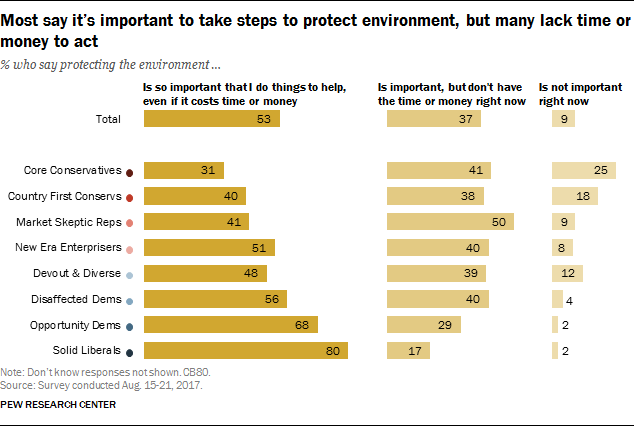 Majorities of all other groups say it’s important to protect the environment, though there are differences in whether it is something they are able to do now. For example, 68% of Opportunity Democrats say protecting the environment is important enough that they do things in their own lives, but smaller shares of Disaffected Democrats (56%) and Devout and Diverse (48%) – two financially hard-pressed groups – say the same. About half of New Era Enterprisers (51%) say protecting the environment is so important that they take steps to do this in their own lives. By comparison, just 31% of Core Conservatives say they do things in their own lives to protect the environment, even if it costs them time or money.